After completing a price trend comparison between environmental products and traditional commodities, a long-time analyst of ecosystem markets says compensatory credits for wetland and species conservation are outperforming commodities like corn and farmland and even gold-giving a more literal meaning to the term ‘green gold.’ Here is the analysis. 26 May 2015 | The market value of compensatory mitigation credits for wetland, stream and species conservation have risen consistently over the past decade, according to a recent review of publically available mitigation credit price data undertaken by Eco-Asset Solutions Inc. (EASI) of Redwood City, California. EASI analyzed over 500 available internet records on price information for wetlands and stream credits, California species and habitat credits, along with nutrient credits traded in the Chesapeake Bay and the Susquehanna River Basin. These records ranged from as far back as the late 1980s to this year. The outcome of this comprehensive research is the Mitigation Credit Price Report. Mitigation credits represent the partial value of ecosystem services such as water filtration, aquifer recharge and biodiversity maintenance. When they are bought, sold or traded in the marketplace they take on the features of other monetized environmental commodities such as carbon credits or renewable energy credits. In each case these credits represent bottom line value to businesses. The value trend for these commodities suggests that mitigation credits have established themselves firmly in the economy. The positive trend for these wetland, stream and conservation credit values has been strong, based on market value insights made possible by U.S. Army Corps of Engineers’ (ACOE) information presented at the National Mitigation Banking Association (NMBA) annual meeting held in Orlando, Florida. Steve Martin of the ACOE Institute for Water Resources, illustrated ‘wetland acreage debited’ for various Corps District Offices from 2005 through 2014 (Fig. 1). The trend line shows a gradual long term rise in credit demand despite the downturn of construction activity (and subsequent decline in mitigation demand) attributed to the recession of 2006-2011. 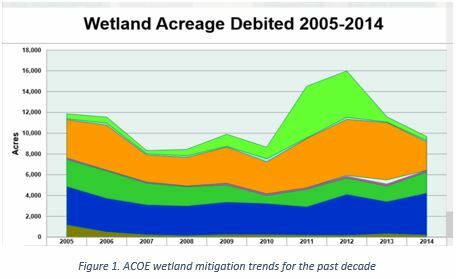 Acre-debits typically result in demand for mitigation credits used to compensate for development impacts in compliance with the federal Clean Water Act, ensuring no net loss of wetland ecosystem services. Acre-debits may occasionally be satisfied by payment of In Lieu fees or through permittee-responsible mitigation. But the increasing trend has been to rely on third party mitigation credits. Credits are available from approved mitigation banks across the U.S. and represent a form of ecological asset – fungible environmental products or commodities bought and sold in the environmental marketplace. 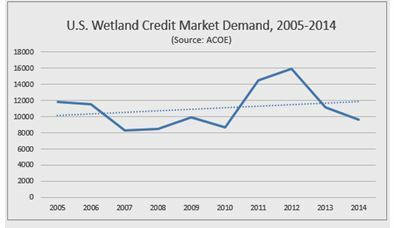 Summarizing the ACOE District information allows us to develop a trend line for wetland credit demand shown in Fig. 2. Next, combining the ACOE record of credit demand with the average market value of those credits through EASI’s price report provides a first-ever appreciation of the market power of mitigation credits. Credit market value is derived from price information but reliable, representative price data has been hard to find, making EASI’s analysis all the more significant. 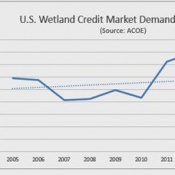 Combining the total annual wetland credit demand (Figs. 1 and 2) with average annual credit prices (Fig. 3) illustrates the total value of the U.S. wetlands mitigation credit market between 2005 and 2015 (Fig. 4). Studying the trend line, which averages annual market value year to year, we see a seven-fold increase (700%) – from roughly $250 M to $1.8 B – in wetland credit market value over the last decade. Very few market commodities have performed as well over the same period of time. We might even say that wetland credits have outperformed many traditional commodities. For example, compare the trend lines for wetland credit prices in Ohio, North Carolina and California, or the value of California habitat credits (Figs. 5-6), with value trends for farmland, corn and cattle (Figs. 7- 10). Farm and ranch land values have varied modestly from year to year but the decadal trend is relatively flat, averaging about $3500/acre nationally, according to AgWeb.com. Corn prices, on the other hand have been falling sharply since late 2010, from around $7 per bushel to about $3.80 today. Prices for live cattle grew in 2014 after plateauing from 2012- 2013. Modest increases are projected for the rest of 2015. This is good news for ranchers since the price of feed has decreased in relation to falling corn prices. Ranch profits will rise if consumers continue to buy beef. Perhaps of equal interest, ecological asset trends suggest there are new opportunities for rangeland owners on underutilized properties they may own or manage. While mitigation credit prices are high, ranchers may want to develop ecological assets right alongside livestock, hay or other traditional agricultural commodities. Mitigation credit ‘stacking’, developing multiple eco-asset streams from the same property base, is now an accepted practice in most areas. Eco-assets have outperformed even gold over the past few years. The symbolism of this is irresistible: gold has long been at the center of the world’s international monetary system. Mitigation credits can now be increasingly seen as the focus of value representing monetized ecological health and related quality of life. This reinforces the meaning of what was once a tongue-in-cheek expression – that environmental commodities were like ‘green gold’ representing revenues earned by protecting or restoring ecosystem services. Green gold is no longer a euphemism based on results of this price trend comparison. In fact, if trends continue, someday soon we may need to differentiate between green gold and ‘gold gold’ – so people will know for sure the kind of value being discussed. William G. Coleman has 40 years’ experience in environmental and sustainability management, specializing in ecological asset development and market management for agri-business and energy companies. He currently teaches global change and sustainability topics at UC Berkeley Extension and manages his own consulting enterprise, Eco-Asset Solutions Inc. in the San Francisco area. He can be reached at wcoleman@ecoassetsolutionsinc.com.